Students of the Civil War may laugh at Meade’s sarcasm, but in an unfortunate way, the general was correct. Since the guns have fallen silent, Meade has gradually fallen from the cast of characters that the general populace associate with the Union war effort. Grant, Sherman, Sheridan—they’re there, but Meade has been shunned to relative obscurity. 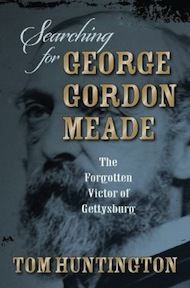 Tom Huntington looks to rectify that in his book Searching for George Gordon Meade: The Forgotten Victor of Gettysburg (Stackpole Books, 2013). Huntington says he started to think of writing his book after, fittingly, reading an article in a Civil War magazine about neglected commanders. “I did not set out to write the great Meade biography,” he clarifies for his readers (ix). The ensuing result can be summarized as a half-biography of the general and a half-travelogue. Huntington summarizes a segment of Meade’s life, and then writes of his own experiences when he travels to the corresponding locations. “I remain uncomfortably aware that there are people who forget more about the Civil War as they brush their teeth with a historically accurate tooth brush than I will ever know,” Huntington says from the very get-go (viii). While highlighting that this is not a battlefield study of Meade’s actions throughout his life, Huntington’s admission also shows off his sense of humor, which is sprinkled throughout the book. He is also unafraid to speak his mind, such as when he writes, “Claiming that slavery did not cause the Civil War is like clearing the iceberg of any responsibility for sinking the Titanic” (7). Later, he likens a Sons of Confederate Veterans-sponsored plane buzzing about at the Museum of the Confederacy to “[A]n especially bothersome insect” (343). As one would expect, the Battle of Gettysburg gets the most attention in the book, as Huntington looks at Meade’s services there and discredits those who later tried to subvert the army commander. Daniel Sickles and Daniel Butterfield are two of Huntington’s favorite targets. Any book has its hiccups and its doldrums, and Huntington’s is no different. He makes small mistakes, but nothing egregious, which can be expected from a man who humbly admits he doesn’t know as much of the Civil War as he’d like to. Examples include putting the Wilderness Church east of today’s Chancellorsville Visitors Center on the Fredericksburg and Spotsylvania National Military Park; the church is west of the visitors’ center. Later Huntington says Alexander Hays commanded a brigade at Gettysburg that had helped repeal the Pickett-Pettigrew-Trimble assault on the third day; Hays commanded the Third Division, Second Corps. Huntington also seems to lose focus in parts of the book, which can slow up the narrative. For example, he has one chapter almost entirely devoted to Daniel Sickles on the second day of the Battle of Gettysburg. With these minor bumps out of the way, I enjoyed Huntington’s book immensely. I appreciated Huntington’s style of writing. I also appreciated his overall experience. At his travel stops, he was usually the lone tourist; I know that situation well. “George Gordon Meade may have won the Battle of Gettysburg, but it seems he lost the war of reputation,” Huntington says at the end of his introduction (8). Hopefully with this new book more people will begin to know Meade, recognize him, and above all, appreciate the services he gave to the Federal Army’s eventual success during the Civil War. This entry was posted in Book Review, Leadership--Federal and tagged George Meade, Ryan Quint, Searching for George Gordon Meade, Tom Huntington. Bookmark the permalink. I’ve recently enjoyed reading the book. As someone distantly related to Meade I’m glad to see him get some modern day attention. I’ve always found him a fascinating character. I liked Huntington’s remarks on what the sites looked like modern day. The mix of history and travelogue really follows in the interesting footsteps of: ‘Confederates in the Attic’ by Horwitz, ‘Land of Lincoln: Adventures in Abe’s America’ by Ferguson, and ‘Assassination Vacation’ by Vowell.